The centre piece of Gus Van Sant’s film Milk, is Harvey Milk himself; A forty year old gay man passionate about changing how his fellow citizens see his “people”, but at the same time unsatisfied with his current existence. Seizing the moment, Milk moves to San Francisco with his partner and sets up a camera shop. Seeing the place of his work and residence, Castro Street, become a growing hub for the gay community, as well as witnessing his friends beaten and killed whilst being ignored by the local police because of their lifestyle, Milk decides to try to make a difference. Eventually he and his team, along with the help of the community to which he finds himself the principal voice, create enough noise to have him elected into public office. As Harvey’s influence grows, so does disgust and confusion towards homosexuals in the San Francisco district and beyond. The biopic of late has had a bit of resurgence thanks in part to the commercial success of films such as Ray, Walk the Line and The Aviator. All were decent films, but strictly on a mainstream appeal. The story of a celebrated gay rights activist’s last eight years alive is one that does not strike you as having as much conventional mainstream attraction, confirmed by it being very political in its chronicle and choosing not too show our central protagonist’s younger years for example. In the hands of curious, yet accomplished director Gus Van Sant however, the finished product, which resembles less a biopic of one man, than an account of a moment in time, is a film delivered in a way that it can be embraced by the broader audience, whilst retaining a bit of the director’s natural quirk. To say Sean Penn inhabits the central role of Harvey Milk could almost be an understatement. The hardened performing veteran, with help from selective prosthetics, evolves into the personality with such ease and grace, you wouldn’t believe he was the same man behind a character such as the intimidating Jimmy Markum from 2003‘s Mystic River. 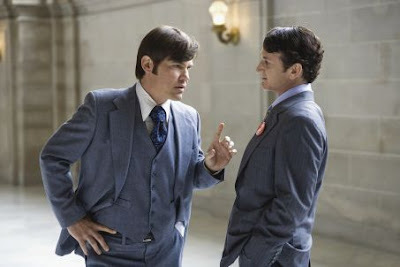 Emile Hirsch and James Franco deserve mention for their equally passionate turns, but it is Josh Brolin as Milk’s political contemporary and eventual enemy, Dan White, who shines the most in the supporting roles. His portrayal is both subtle and unhinged. Plus it is an achievement provoking empathy over demonising someone who would be best described as ’the bad guy’ in a film. Unique visual and sound editing helps the film greatly, giving it distinctive structure as we jump between Harvey documenting his thoughts on a tape recorder, to the actual events of the time. This device also helps distance Milk from being just another biopic. While it is still immensely watch able, the film is not without it‘s flaws. To be fair though, most of the concerns are unavoidable when working in such a genre, and being political by nature, Dustin Lance Black’s Oscar nominated screenplay still avoids getting bogged down with such jargon, allowing the emotion to filter in - although perhaps not enough to wholly satisfy. Overall, bringing such an important man and moment to life in what is seen as a medium more focused on entertaining than reporting, the combination of director, screenwriter and actor have given us the best we could have hoped for.